The Chilean Crocus. 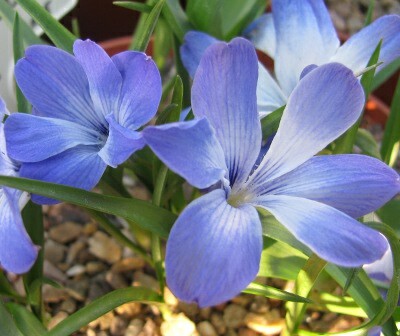 These plants are not reliably hardy in UK, to be grown successfully they should be repotted every second year into a well drained gritty John Innes Nos.2 compost and watered sparingly until growth commences in early winter. We recommend pots are plunged into a deep gravel cold frame and remain covered overhead in winter and when dormant in summer. Flower in March and April. 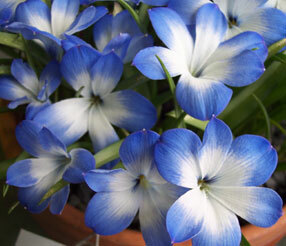 Large white centre with very attractive mid sky-blue outer tips to the petals. 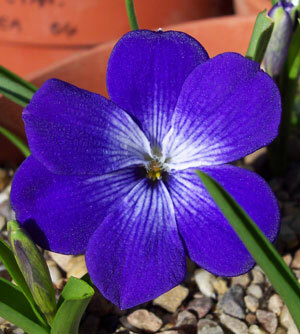 Limited availability of this relatively new selection, A hybrid between 'Leichtlinii' and 'Violacea'. Alpine house or cold frame culture. Large, striking and distinct purple-violet flowers.